Arshile Gorky’s journey to Abstract Expressionism was both brave and terrible, his work is a genuine attempt to express ideas with deep underlying emotions. He was grappling with new and diverse notions at a time of seismic changes in the American art world. When Arshile arrived in America, at just 16 years of age, he was at liberty to reinvent himself. He did this with little reference to the truth and why not? The real Gorky was born in a village on the shores of Lake Van (currently Turkey) his family was Armenian. When he was a child of 4 years old his father left, emigrated to America, thus avoiding the draft. Later during the Armenian Genocide (Ottoman Turk campaign) Gorky, his mother, and his younger sister all survived a death march, but his mother never really recovered. She took the family to a Russian controlled area for safety where she died of starvation. At this point Arshile left for America himself. It was some years after his enrolment in the ‘New School of Design’ in Boston USA that Gorky began his picture ‘Artist and his Mother.’ The painting has a still, calmness about it which detaches from time. His young mother looks straight into us and Arshile stares vaguely past. You can see the influence of both Picasso and Cezanne in the painting. The serenity and order are reminiscent of Piero della Francesca. His mothers demeanour and attire connect, in my mind, with the current tragedies of many families in the near east, bringing the painting into the here and now with a tide of sadness and loss. There are two versions of the painting both appear unfinished. Around this time Gorky got work as a part time instructor at the Boston School and later at the Grand Central School of Art in New York. He was one of the first artists to enrol on the Federal Art Project (1935-43) which gave a salary to artists in exchange for easel paintings or public art. Other artists who later became known as the Abstract Expressionists also enrolled in the project during the Great Depression. The project provided valuable financial support and also helped forge some of the artistic bonds that fed into the birth of Abstract Expressionism movement. 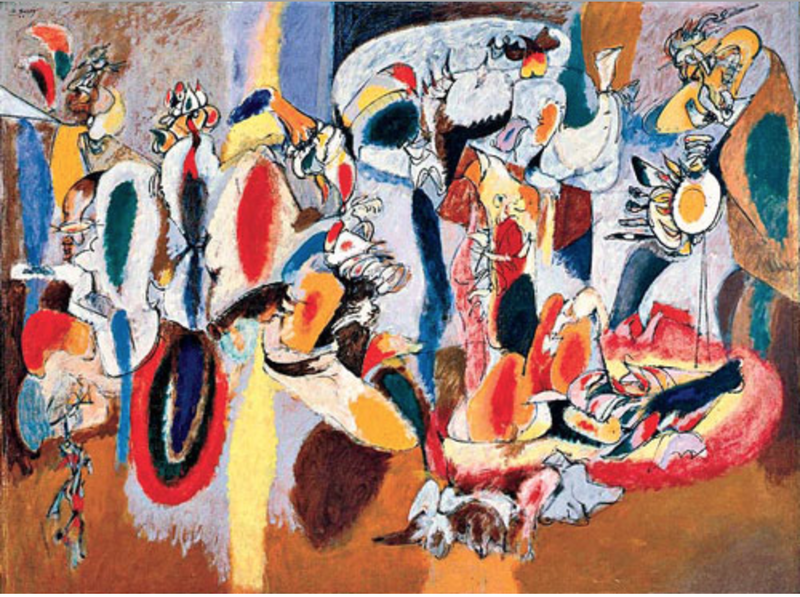 The exact route that Gorky took to his later paintings was convoluted and experimental. His strong belief in the fundamentals persisted. Gorky was one of the first artists to give his abstract work objective titles enabling the art work to ruminate and flower somewhere in our brains. From 1946 further traumatic events befell Gorky in his personal life- cancer, a fire where his studio burned down, his neck being broken and his painting arm temporarily paralyzed in a car accident and also his wife’s affair and subsequent departure in 1948 with their children. The same year Gorky hanged himself at the age of 44.